[Book excerpt] Gandhi’s slogan of 'do or die' after Quit India was far more compatible with Subhas Chandra Bose’s views than anyone else's. The Indian National Army trials (of captured members) began on November 5, 1945 at the Red Fort in Delhi, as three stalwarts of the Azad Hind Fauj — one a Muslim (Shahnawaz Khan), one a Hindu (Prem Sahgal) and one a Sikh (Gurbaksh Dhillon) — arrived at Subhas Bose’s "Chalo Delhi" destination in ironic ironclad circumstances. The commander-in-chief of the British Indian Army, Claude Auchinleck, had reported to his bosses on October 31 that the Indian Army would accept the INA trials as "the majority view is that they are all traitors". And he believed that stories about the INA’s returnee troops (who numbered no more than 23,000 survivors) would be overwhelmed by those of loyalist British Indian Army troops (numbering nearly a million) who would be returning to those same villages and towns. Hugh Toye, the British spy who delved into Subhas Bose’s life and became a grudging admirer, knew that there already were underlying problems with this view because the nature of demobilisation in Malaya had allowed the intermingling of INA prisoners and British Indian Army loyalists for too long. It had taken several months to evacuate the Indian troops, who were still the last ones to be repatriated after the British and Australian ones, so even the loyalist troops’ views and opinions about the war and nationalism were coloured. 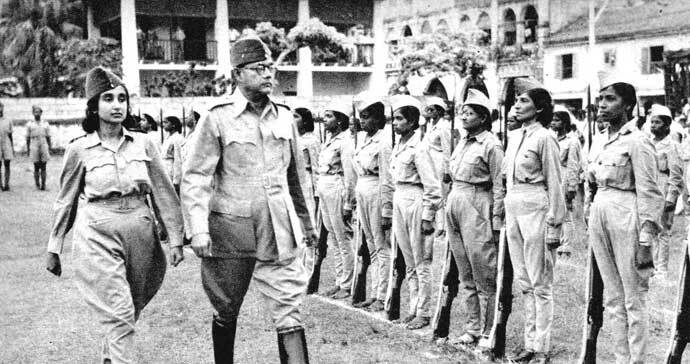 Subhas Chandra Bose and Captain Lakshmi Sehgal lead a company of Azad Hind Fauj. During the war, there had been a complete blackout in India of any news about the INA. If any news reports mentioned them at all, they were scornfully dismissed as no more than small clusters of JIFs (Japanese Inspired Forces). While young Indians had been listening in to Bose’s broadcasts, their newspapers contained almost no reports about the INA’s actual role as a freedom army that fought a war for India’s independence. So, when the newspapers began to carry detailed reports about the INA trials, the vast majority of Indians (and, especially, British residents of India) began hearing for the first time about the heroic fighting by an ill-equipped and poorly-supplied but valiant freedom army of soldiers and civilian recruits, men and women, who had been prepared to lay down their lives so that India could be free. It had an electrifying impact on the nation, spurred further by the upright and attractive personalities of the three officers facing trial. SA Ayer recalled the thrill of realising (upon his arrival in Delhi from Tokyo to testify at the trials) that the "INA had literally burst upon the country... from the Himalayas to Cape Comorin was aflame with an enthusiastic fervour unprecedented in its history". On November 20, a secret note from the head of the Intelligence Bureau (IB), Norman Smith, agreed that "there has seldom been a matter which has attracted so much Indian public interest and, it is safe to say, sympathy." The evidence was everywhere: massive demonstrations and a strike (hartal) had been called across Punjab on the first two days of the trial, with thousands of students demonstrating in Lahore, Lyallpur and Rawalpindi, and "INA days" had been held in Karachi, Madras, Vellore, Salem and right across the length and breadth of India. In Madurai, two people were killed in police firing, and three days of strikes and police firing in Calcutta followed by rioting resulted in thirty-five deaths and several hundred injured there between November 21 and 24. When the INA was fighting in the trenches and forests of Manipur and Nagaland, Jawaharlal had provocatively travelled to Bengal and Assam and said that he would personally oppose Subhas Bose even at the head of his army. Demonstrations in sympathy with the Calcutta victims occurred in Dhaka, Patna, Benares, Allahabad, Karachi and Bombay (with several killed in police firing) and the IB was especially concerned about a growing undercurrent of anti-European feeling evident in these demonstrations. Posters had appeared in Delhi and Calcutta threatening to kill twenty Englishmen for the hanging of every INA hero. British bosses were startled to hear their employees refer to Subhas Chandra Bose (who had been so demonised in the English-language press) as "the George Washington of India", with photos of him and the three INA officers taking on iconic status throughout the country. Shops refused to serve British clients, and increasing evidence of racial hostility towards the British was manifested in mounting stories of insubordination across the country. The governor of the Central Provinces was amongst the first to voice doubts about the willingness of Indian troops to fire on mobs — comparing the atmosphere to that which prevailed in 1857, the epitome of British fears about their presence in India. The Congress party — moribund in the wake of the crushing of Gandhi’s Quit India movement — had been revived partly by this rush of patriotic fervour. And the Muslim League too came out strongly in favour of the INA, somewhat ironically so, given Bose’s hostility to Jinnah in his broadcasts. The very fact that Muslims had such a prominent role in the Azad Hind army and government made it impossible for the Muslim League to ignore the INA, and joint Congress-League demonstrations were held in support of the INA in Delhi, Calcutta and Lahore in a rare moment of unity. Jawaharlal Nehru, having effectively retired from the bar some twenty-five years earlier, decided to join the INA officers’ defence team alongside the veteran Congressman Bhulabhai Desai and the seventy-three-year-old ailing barrister Tej Bahadur Sapru. This was an ironic twist for Nehru: when the INA was fighting in the trenches and forests of Manipur and Nagaland, Jawaharlal had provocatively travelled to Bengal and Assam and said that he would personally oppose Subhas Bose even at the head of his army. INA veterans like John Jacob and Janaki Davar told me how bitter they were about this act of treachery by a man whose name adorned one of the INA brigades. It was, no doubt, an important reason why the British were far more willing to have Nehru as an interlocutor in 1945-46 than Gandhi (who Wavell described as "shrewd but devious and malevolent" and refused to meet), apart from the fact that, like Churchill and Amery, he was an old Harrovian, albeit one with Fabian Socialist leanings (which, in turn, were later to prove appealing to Attlee and Cripps, who shared many of those leanings). In the end Nehru’s membership of the defence team was little more than symbolic, as Bhulabhai Desai’s eloquent advocacy needed no substitutes. In a brilliant ten-hour summation, Desai argued that it was "not a case of three individuals waging war against the King, but the right of the Indian National Army — the organised army of a duly-constituted Provisional Government of India — to wage war for India’s liberation". A war for the liberation of a people, if properly declared and conducted, gave those waging such a war the rights and immunities of belligerents, as Britain had in the past conferred through support of Bolivarian rebels in South America, of the Confederate Army in the US Civil War, of Garibaldi in Italy and Byron in Greece, or indeed of Dutch, Polish and Yugoslav governments-in-exile during World War II (even while they had no territory to call their own). While acknowledging that some of the INA men had a previous allegiance, Bhulabhai argued that their "king" and "country" did not coincide, as they had not in 1776 for George Washington and his men, who had consequently repudiated their allegiance to the British crown in order to fight for the rights and independence of their country. Shahnawaz, Sahgal and Dhillon had done precisely the same thing as the Americans whose descendants were now the friends and allies of England and "their warmest and greatest supporters in the task of saving civilisation". Desai argued that at Singapore’s Farrer Park on 16 February 1942, when Colonel Hunt had handed the Indian soldiers over to the Japanese, their bond of allegiance to Britain was broken, and "to insist upon an everlasting allegiance on the part of a subject people would be tantamount to... perpetuation of their slavery". Since the Provisional government controlled territory (Andaman and Nicobar Islands for eighteen months, Manipur and Bishnupur areas for four months, and the area of Ziawadi), it had more legitimacy in declaring war than the Czech and Polish partisans that Britain had supported in World War I. The "municipal law" of British India on treason therefore did not apply, argued Desai, but the provisions of international law did. And while the latter had not acknowledged the rights of non-European peoples until the nineteenth century (including their right to sovereignty and self-determination), they surely did in the twentieth century. Brilliant and colourful as this argument was, the three were inevitably found guilty of waging war against the King, but not murder. On 3 January 1946, they heard that their sentence was not execution — the first surprise. Instead, they were to be cashiered (dismissed from service), forfeit all pay and allowances, and receive transportation for life. Then, as the American historian Peter Ward Fay described it, "the officer added, in a low matter-of-fact voice, that with respect to transportation for life... the sentence had been remitted by the Commander-in-Chief". The three INA men were confused and asked what they should do now. They were told that they were free to go! Where? "If you have people in Delhi, go there. Otherwise we’ll make a booking for you on a train to Lahore." In Delhi the next day, Asaf Ali of the Congress organised a massive rally attended by well over 1,00,000 people, rapturously chanting "Azad Hind Fauj Zindabad!" and other slogans. When they took the short train ride to Lahore the next day, the Senior Police Superintendent there reported that "a seething mass of humanity stretching back into the heart of the City" had gathered to welcome "the three heroes of the Delhi trial... and celebrate their victory". The tumultuous welcome from an ecstatic crowd of nearly a hundred thousand of their fellow Punjabis was the ultimate vindication for the three heroes and the army they had fought valiantly for. "It was the triumph of the INA", as historian Fay put it. Auchinleck had made the extraordinary decision to remit the sentences because the turmoil induced by the INA trials of November-December 1945 had fundamentally changed his mind about the loyalty of the Indian Army. The first bombshell came from the governor of Punjab, Sir Bertrand Glancy, on November 17. Glancy said in his memorandum that Shahnawaz, Sahgal and Dhillon are considered heroes in the eyes of most Punjabis, and treating them as "traitors" only adds to their popularity. A death sentence for these heroes would result in far worse violence than in 1942 or 1919 (preceding the Jallianwala Bagh massacre) and make a constitutional settlement extremely difficult. In particular, Glancy asserted that the trials were serving no useful purpose; although the current trial could not be abandoned (as that would embolden Congress too much), he advised that future trials should be dropped, and must not carry the charge of treason, which was inflaming the greatest resentment. He was also certain that the presence of even the small number of INA returnees to the villages was bound to "infect" all demobilised soldiers, and nationalist feeling was now spreading fast across the Punjab. If this vital recruiting ground for the Indian Army were no longer securely loyal, Britain’s hold on India would erode rapidly. Three days after receiving Glancy’s memorandum (and the minutes of a conference called to discuss it), Auchinleck recommended that treason trials should cease. And he began his own investigations of what Indian officers really felt. On November 27, Sir George Cunningham, governor of NWFP, went further than Glancy, advising Auchinleck that "as Indian opinion is opposed to the trial of these persons, he wipes the whole thing out and takes no further proceedings against anyone". He urged Auchinleck to halt the first trial and cancel all subsequent ones. Despite the strong opinions of the governors of the two provinces from which the majority of soldiers were still recruited, the Commander-in-Chief was not convinced at first, and pressed on with trials of those accused of "brutal acts" while forestalling new treason trials. But by December he was reporting to London that, in the event of an insurrection, British battalions alone would need to be deployed to suppress them, but there were too few of these in India to accomplish the task. "To regain control of the situation, nothing short of an organised campaign for the reconquest of India is likely to suffice." He requested three additional British battalions, but the British Cabinet flatly denied those to him: troops were being rapidly demobilised, and there simply was no appetite amongst soldiers to return to new battle duties in India. And when pressed, Indian officers had quietly admitted to Auchinleck that they could not be sure of their men’s loyalties if an insurrection occurred, and most were not able to assure their own personal loyalty in such a situation either. Auchinleck had concluded that every Indian soldier was a "nationalist" now, with only the degree differing. In a "personal and secret" letter to all senior British officers explaining his decision to remit the sentences on Sahgal, Dhillon and Shahnawaz, Auchinleck wrote that while most Indian officers acknowledged the "gravity" of the charges, "practically all are sure that any attempt to enforce the sentence would have led to chaos in the country at large, and probably to mutiny and dissension in the Army, culminating in its dissolution". The historian Peter Fay concluded: "In the autumn of 1945 India was swept by a storm of excitement and indignation, a storm that Bose and his renegades ignited. It was a storm the Indian officer, and the jawan too, could not ignore. They did not ignore it. In 1942, at the time of Quit India, there had been no question of their reliability. Now their own commander doubted it. Three years of campaigning, three years climaxed by battlefield victories in Europe and the Irrawaddy, do not explain the change. Only that autumn storm can. It was the Indian National Army that forced Britain’s hand. "At the height of the Quit India agitation of 1942, a hundred thousand new recruits were enrolling in the British Indian Army every month. In the aftermath of the patriotic fervour induced by the INA trials, soldiers and officers had all become nationalistic for the first time and could no longer be relied upon to fire on their compatriots in the event of an insurrection. The basis of the British empire — the unquestioning loyalty of the Indian armed forces — had been thoroughly undermined by the INA trials. Thwarted in its advance on Chittagong and the plains of Assam in 1944, the Azad Hind Fauj had succeeded in its ultimate goal in late 1945: of inciting the patriotic fervour of the Indian people, and spreading that ardour from civilians to airmen, sappers and soldiers of the armed forces on which Britain’s imperial rule depended. General Francis Tuker too noted that anger over the INA trials was threatening the edifice of the Indian Army, the implicit loyalty of which underpinned the British imperium. The Congress president, Maulana Azad, who had always been skeptical about Bose — and especially of his decision to form an army of liberation — felt the anger tangibly on streets across India: "Wherever I went during this period, young men of the Defence forces came out to welcome me and expressed their sympathy and admiration without any regard for the reaction of their European officers." Gurkha soldiers lined up to meet him in Lahore, and police constables in Calcutta shouted pro-Congress slogans when they saw him. In Karachi, naval officers told him they would support Congress in the event of any confrontation with the government. In January 1946, there was a near-paralysing strike by 5,200 officers and pilots of the Royal Indian Air force (RIAF). On February 11, riots broke out in Calcutta and elsewhere after the sentencing of an INA soldier called Rashid Ali to seven years’ rigorous imprisonment for murder. Simultaneously trouble was brewing since February 8 on the HMIS Talwar, a signals training ship based in Bombay. On February 18, this became a full-scale revolt, with demands for the release of all INA prisoners, the equalisation of pay between British and Indian sailors, and the withdrawal of Indian troops then fighting in Indonesia on the British and Dutch side against Sukarno’s nationalist army. Being a signals ship, the Talwar mutineers were quickly able to communicate with other ships and soon seventy-eight of the eighty-eight ships of the Royal Indian Navy (RIN) had joined the mutiny, which spread to all the key ports along the west and east coast of India. A massive sympathy strike amongst the civilian population of Bombay paralysed life in that city for several days. The day after the full-scale RIN mutiny began, Britain’s Prime Minister Attlee announced he would be sending the Cabinet Mission to India to begin negotiations for India’s independence. As late as January 14, 1946, the Attlee cabinet had agreed that if India and/or Pakistan could not ‘stand on their own feet economically’ or for purposes of defence, Britain had "a moral responsibility" not to hand over the country until India’s people had appropriate plans to solve those problems. "We should not, therefore, in fact be able to divest ourselves of our responsibilities, however much we might appear to do so... If no solution is reached... we should continue governing India even if it involved rebellion which would have to be suppressed by British troops." The RIAF and RIN mutinies, rumblings of growing dissent in the British Indian Army itself, and Auchinleck’s clearly expressed opinion that the British could no longer rely on Indian officers or soldiers to put down an insurgency, all had combined to change the mind of Attlee’s cabinet within five weeks. India’s national politicians were more concerned about the ongoing provincial elections, but appeared to have been convinced by the sincerity of Attlee’s declaration of February 19. Sardar Vallabhbhai Patel hurried to Bombay on February 22, went aboard several of the mutinous ships and urged their leaders to surrender: Patel had done a deal with Auchinleck to spare them any punishment. Jinnah had similarly discouraged Muslim sailors, Gandhi scolded the navy men for the "unbecoming example" they were setting, and Nehru expressed the need to curb the "wild outburst". The British now needed Indian politicians to help them restore order within the armed forces, which had provided the vital if implicitly coercive underpinning of their rule since 1858. Although the sailors largely did respond to Patel, it took military intervention to subdue the civilian population — and only after the deaths of 228 civilians and injuries to 1,046. It had still been the biggest mutiny faced by the British since 1857 and militarily a much more dangerous one. The army was not unaffected, as the Jabbalpore regiment mutinied, and several engineering units of the Madras Regiment also joined the rebellion. 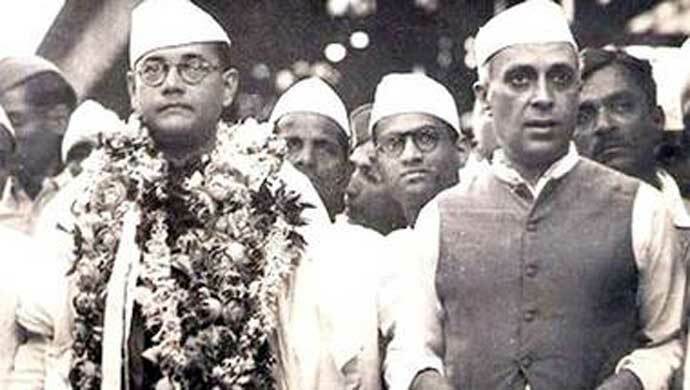 Subhas Bose’s prediction on July 9, 1943 at Singapore’s Padang ("When the British government is thus attacked... from inside India and from outside — it will collapse, and the Indian people will then regain their freedom") came fully to fruition in February 1946. Nehru’s biographer, MJ Akbar, wrote: "It was the first time since 1857 that the military had revolted, and the British caved in. The Empire was over." Yet there are no commemorations of February 1946, the month in which Britain’s Indian empire was finally brought to its knees by the force of arms, when the INA trials convinced Britain’s Indian sailors, airmen and soldiers that they were indeed what Subhas Bose had called them: "an army of occupation". Once thus edified, they rose in revolt and Britain decided within weeks that the empire could no longer hold. It suited both the Congress and the British to foster the myth of a peaceful "transfer of power", which flattered the alleged British commitment to "fair play and the rule of law" and the Congress’ conceit that Gandhi’s non-violent movement alone had enabled India to achieve independence in the "noblest" manner possible. The reality was more complicated — although the Congress party has worked assiduously to obliterate the role of the INA, in particular, in bringing India her independence. When I broached with Vayalar Ravi (then India’s minister for overseas Indian affairs) the subject of merely commemorating the 25,000 volunteer soldiers from Southeast Asia who had fought for India’s independence, he said, "Mr Basu, your view of why India got its independence is quite different from our Congress view". He did not let me convince him that my view was not that different from his: India could never have won its independence without Gandhi’s nationwide mass mobilisation; but that alone was not enough (as 1930 and 1942 showed quite emphatically), and it needed the INA to undermine the implicit loyalty of the British Indian armed forces for the British to finally concede India its independence. Gandhi, in particular, knew he could not depend on the British sense of fair play. Like most nationalists, he had learnt that bitterly from the experience of 1919, when the British reneged on their pledge of August 20 1917 (by Montague in the House of Commons) to move "progressively towards self- government" for Indians after the war, and instead implemented the draconian Rowlatt Act of 18 March 1919 and the desultory "diarchy" of the Montague-Chelmsford Reforms. After all the platitudes of the "saintly" Irwin, Gandhi got precisely nothing but classic colonial tactics highlighting dissonant Indian voices at the Second Round table Conference (1931). This eventually led to the Government of India Act of 1935, under which India’s provinces got some autonomy (but still subject to the whims of the British-appointed governor of each province). The 1935 Act conceded less self-rule at the federal (national) level than Hong Kongers were to have in 1996, with more than half of India’s federal parliamentary seats appointed by Britain and her allies (the princely states). In the end, Gandhi and Bose were allies after 1942 with Gandhi’s slogan of "do or die" after Quit India far more compatible with Bose’s views than those of Nehru or Rajagopalachari. 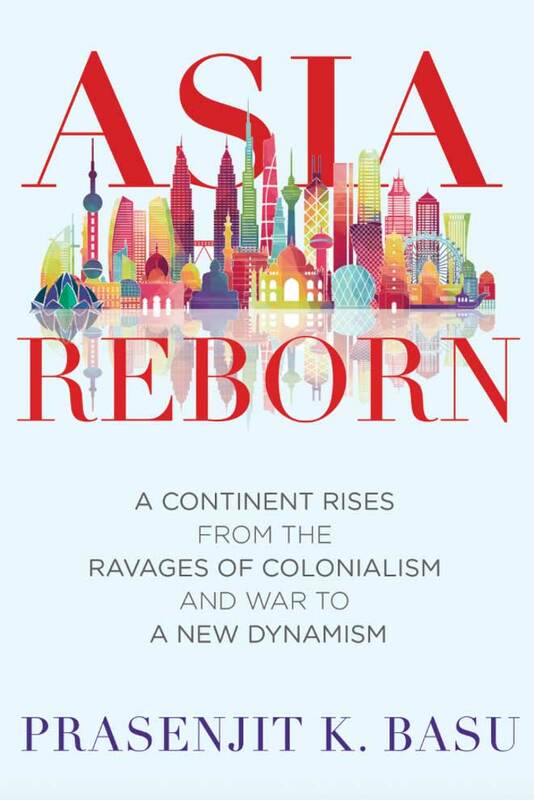 The author is a Singapore-based economist. He was formerly chief economist for Southeast Asia & India at Credit Suisse First Boston, Chief Asia Economist at Daiwa Securities, and global head of research at Maybank group. He is a regular commentator on Asia on the BBC, Channel News Asia, CNBC, Zee Business, etc., and has written commentaries for the Financial Times, International Herald Tribune, The Statesman, Asian Age, Singapore’s Business Times, The Edge, and IndiaSe.